I have had the pleasure of reading a couple other children’s books by Saragine Francois, so I was excited to get to review yet another of her illustrated books! 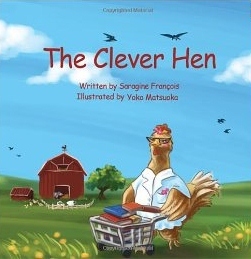 This particular title is “The Clever Hen”, written by Saragine Francois and illustrated by Yoko Matsuoka. As the title suggests, “The Clever Hen” is about an intelligent hen…one who has let her intelligence turn her into a snob. Ms. Cleever, as the hen is called, is a bird who likes to spend her time with intellectual pursuits. She has no time to chat with friends or to help out others in their time of need. She feels that her intelligence puts her above all the other barnyard animals, so she doesn’t think she needs any of them in her life. Luckily, by the end of the story, our clever little hen learns a lesson. In an unexpected twist, Ms. Cleever finds herself thrust into the position of needing assistance from others. Of course, since she has so rudely turned others down when they needed help, no one is anxious to run to her rescue. The story does have a happy ending, but even more importantly, it teaches an important lesson about kindness and treating others the way you wish to be treated. The illustrations really bring the book to life and complement the storyline perfectly. This story would be a great pick for children ages 3-9, especially for children who may have difficulties relating to their peers in a healthy manner. Kindness is a virtue that is needed at all ages and in all circumstances, so it is never too early to start teaching children this valuable lesson. For more information about the book, or how to order it, please visit the author’s website, www.saragine.com. < Being indie isn’t easy!